I’ve always been fascinated by teachers who are true life long learners. Those who understand that our work is a practice and that there are always professional development opportunities that are available to us to pursue for both personal and professional growth. I would have to say that my love for continued learning has in part been inspired by my parents who are constantly taking courses in order to grow. For the last few months, my mother has been taking a course in Critical Thinking and Creativity. I have to admit that I usually love following along in her modules to learn with her but didn’t get that opportunity this time because of my schedule. The course was developed to foster Critical Thinking and Creativity and yet when it came to her culminating activity, – in my opinion – the course fell short and this opened a discussion about how we might be doing the same in Elementary and Secondary classrooms. In our board, consideration has been given to the understanding and implementation of the Global Competencies. We have even gone as far as creating a site with Learning Experiences that teachers can use in classrooms as we work towards helping our students to become globally competent. I found it interesting that my mom’s course would be in developing 2 of the competencies in participants. As mentioned before, I thought that her culminating activity was everything but creative and used very little critical thinking in order to put it together. When she first told me of the task, I was excited and wondered how I might be able to introduce something similar with my students but as the printer continued printing the long list of specific expectations, it became apparent that there was really only 1 way to be able to accomplish the task and the exemplars provided, solidified this understanding. As I watched my mother work through her assignment, I started to reflect on the assignments that I offer to students that are considered open, and wondered if in reality, they really foster creativity. Am I truly getting my students to think critically about information provided to them or simply getting them to regurgitate facts based on their research? How am I doing that? In the creation, am I encouraging students to be creative in their own way or am I limiting what they may create by what I hope to assess? 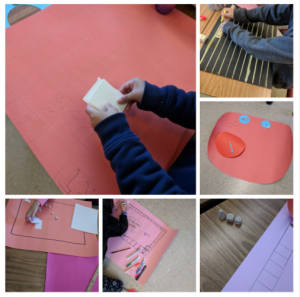 A few weeks ago, we started working on a board game project for Social Studies. The idea came from the book, Launch: Using Design Thinking to Boost Creativity and Bring Out the Maker in Every Student. My goal was to have students uncover parts of the Social Studies Curriculum and then create a board game, not a bored game. The grade 4s had a focus on the following expectations around the Political and Physical Regions of Canada. The grade 5s focused on the following expectations based on the Role of Government and Responsible Citizenship. After doing some research and learning collaboratively about Canada, they were asked to select the expectation that they would like to focus on. From there, they worked on their own individual research that they would submit with their board games at the end. 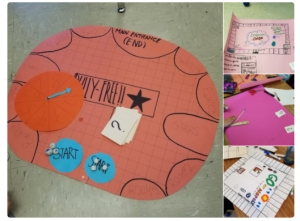 Although we made some general guidelines about what was to be contained in their board games, it was open for students to create and for some, it appeared too open. Many wanted to know what they could do to get a B or an A and were expecting a list, similar to my mother’s. I struggled with finding a balance between providing enough support while at the same time giving them the freedom to try something, even if it didn’t quite work out the way that they expected. After investigating some of the qualities of games that we enjoyed as well as exploring some that were new to us, we worked together as a class to come up with our success criteria that was based on both the Social Studies and Language Curricula. Posted in the class, it was available for all students to review as they continued to work, not for the specific way to create the same cookie-cutter board game but rather to make sure that they were critically thinking about their research and their ability to communicate the learning by guiding players with their procedural writing. What I noticed during this activity was that students wanted to dig deeper into developing and sharing a plan of social or environmental action rather than merely providing facts about Canada. Many of my students looked at issues from bullying to deforestation and urbanization and considered creating games where people were given ways in which to have a positive impact in our country. As I mentioned before, we are well into the creation stage and will continue in the new year. I do wonder however, if by calling it a board game, if I have steered them into a specific direction. Could it have been just a game where I may have seen a greater diversity of materials being used from physical to online? Did I in reality just do the very thing that bothered me so much about my mother’s course? Ask students to create something that wasn’t bored and yet steered them all into asking for bristol board? I’m on a path to really reflect on the types of tasks that I design for students while expecting them to become critical thinkers who are creative. This has now become food for thought for future tasks that we’ll embark on. Please stay tuned!